Construction video and photography for documentation is evolving along with the digital transformation sweeping construction and engineering as a whole. Learn how VIATechnik is leading the charge by leveraging new interactive 3D visualizations to offer virtual construction design, BIM and CAD services across a variety of VDC and constructiion management services. Get an in-depth view of how new photographic 3D scanning techniques are shortening field-to-finish time and reducing rework across a range of project types. Want a better, faster, and less costly construction documentation tool? 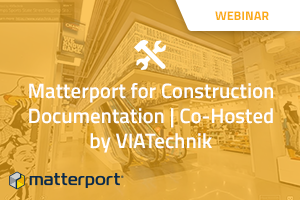 Watch our on demand webinar today to discover how VIATechnik, a virtual design and construction services firm, is using Matterport’s fast, inexpensive 3D reality capture soolution to streamline workflows and replace time-consuming 2D photographic documentation. Say goodbye to taking and organizing hundreds of pictures, and say hello to a fully-automated construction documentation solution that will save you hundreds of hours on return site visits. Sign up today to learn how you can improve collaboration and expedite projects by bringing your jobsite directly to your office. How do you deliver accurate, detailed project observation reports? How can you impress clients with the quality and responsiveness of your documetnation and communication? Whether they are spec'd into your contracts or offered to delight your clients, detailed documentation is key to establishing trust with a client and offering outstanding services that set you apart from competing GCs. Traditional methods force you to create construction logs tagged with photos or organize hundreds of individual construction video and photo files to communicate to stakeholders and the project owner. 360˚ photos or physical logbooks are also used. Often a documentation method is chosen becuse it's inexpensive and easy - even if it doesn't necesarily impress your client. By leveraging 3D reality capture and Matterport's seamless, AI-powered 3D content platform, VIATechnik is able to provide bi-monthly progress scans that are simple and easy to navigate, and cost-effective to produce. VIATechnik explains how they conduct bi-monthly progress scans and milestone documentation using low-cost RGBD reality capture. See their workflow with their two-story Champs commercial retail project. By leveraging a visually accurate 3D scan, they are able to show progress over time by referencing the same scan point within scans taken at different stages of the project. Discover how you can underscore your progress to your internal office teams, field teams, and site owners or brands vividly with photographic 3D scans. Traditional construction photography and construction videos don't give your office staff a full picture of job progress. On this commercial project, VIATechnik created full-coverage observation scans to keep tabs on how the job was progressing and make real-time modifications. VIATechnik works on projects from commercial and tech to healthcare, including Apple and Google campuses, O'Hare Airport, and other large-scale commercial and industrial projects. They work with some of the largest general contractors in the country including Mortenson and AECOM, from architects to owners to engineering firms. They use Matterport most with general contractors to provide high-tech construction documentation.